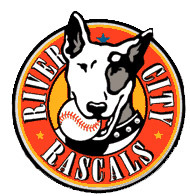 Q's surprise last night was going to our first ever River City Rascals game. We've been talking about it for a while, and since we're too poor to see the Cardinals play, this seemed like the perfect option. Plus, the Cards got their asses handed to them by the White Sox yesterday in a shameful, shameful display. And the Rascals won. We sat four rows from the field, right near first base, and the tickets were $8. We could actually tell if the players were cute or not (well, Cootie and I could, the boys were more interested in the t-shirt/promotions girls camped out next to us). Some were cute. Some had cute butts. And a lot grabbed themselves. I guess those uniforms aren't so comfortable on the man parts in the ungodly heat. The food was reasonable (not awesome, but that's okay), the t-shirts and merch were cheap (we all got jerseys for $10), parking is free, and they had O'Fallon beer on tap. If you live in St. Louis, and haven't tried O'Fallon's beer, you're missing out. You can find it at most grocery stores, and in some restaurants. It's hard to imagine a beer company nowadays could compete with Bud or Schlafly, but they seem to be getting bigger and bigger, and are making quite a name for themselves. I guess that just goes to show that the consumer wants something that tastes better than Bud products. Pee almost tastes better than Bud products. I don't actually know that; I'm just guessing here. Plus Bud is evil - their Bud Sports League stole the kickball rules from the SKA league (the one I play in) and copyrighted them. Shrewd, yes. Fair and nice, no. Especially when Bud can afford to have someone draft their own set of rules (it's pretty similar to baseball; they once owned the Cardinals), while SKA is nonprofit. Bastards.